Founded by Sir Robert Geffrye, the museum is a former site of almshouses built to house the financially insecure elderly from 1714. It was converted to a museum of furniture and industry by London Country Council in 1914. 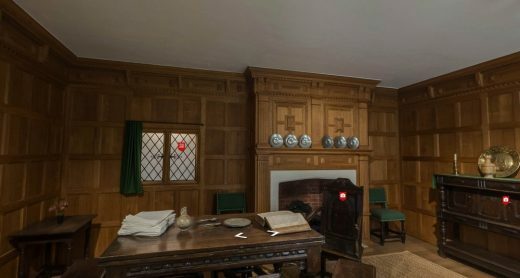 Since 1930, displays of domestic life have been exhibited here to depict period rooms from the 1600s, to the present day. 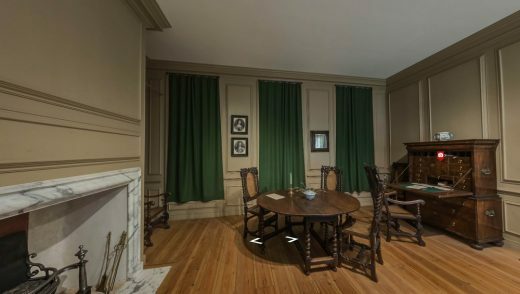 The museum combines careful architectural surveying, original furniture and decor with reinterpreted rooms that are built from studying other historical documents, such as household inventories, literature, diaries, letters and business accounts. The museum is also filled with, and organised according to original paintings, prints, drawings, photographs and film. 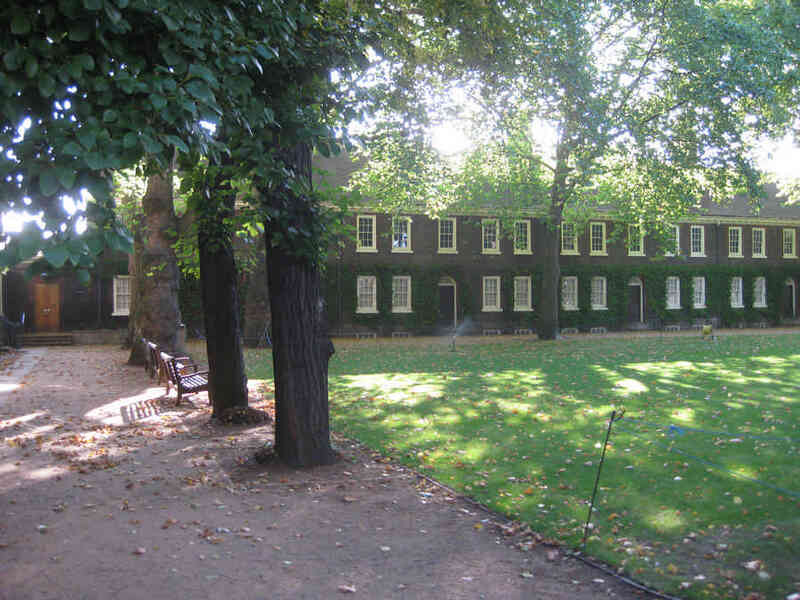 1630: A hall which stood before the Great Fire of London, used as a relatively public space for family and household employees to spend their time, receive meals and entertain guests. The hall was often located on the first floor, as the ground floor was mainly used for commercial purposes by families at this time. 1695: A Soho parlour constructed during a period of intense rebuilding from the fire’s damage. Regulations meant houses were built in brick to a common pattern. With the ground floor still mainly used for commercial purposes, people tended to live on the upper floors, reached by a staircase at the back of the house. The main living room – known at that time as the parlour or dining room – would be the largest at the front of the house overlooking the street. 1745: A a second parlour, this time of a typical eighteenth century Covent Garden townhouse that is lavished with the exotic goods of the East India Company’s early imports. Townhouses were proving to be successful forms of urban housing, adaptable in scale and grandeur. 1790: An Islington parlour room filled with goods from Britain’s rapidly expanding overseas trade and manufacturing industry as the ‘middling sort’ became increasingly affluent. Homes such as these were now able to obtain carpets, textiles, wallpaper and furniture of increasing variety at more affordable prices. term ‘interior decoration’ also came into popular usage, coined by Thomas Hope in 1807 as a growing number of publications began to cover ‘how to furnish in style’. 1870: The Victorian parlour became an idealised refuge. Home comfort, peace and warmth are all displayed in this typical Victorian townhouse. With the workplace becoming more separate from home life this century, and with middle class abodes moving to the city’s outskirts, these townhouses became a place to focus on accommodating family. Deep-buttoned upholstery, elaborate curtains, indulgent fitted carpeting and richly decorated furniture all heartily expressed these Victorian notions of supreme comfort. 1890: A small Victorian room depicting the era’s taste for the Aesthetic Movement. From the simple straight-line furniture which came with the reopening of trade between Japan and the West in the 1850s, to the Islamic and Moorish art of the 1870s & 80s. The fireplace is still firmly the central feature of a room, it is fitted in this home with a grate of coloured tiles and an elaborate ‘Queen Anne’ style overmantel. 1910: An Edwardian suburban drawing room and hall. 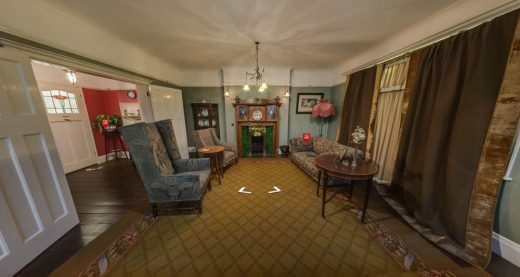 It is based on the homes built in 1910 Golders Green, incorporating high gables, steep roofs and casement windows, decorating within the ideals of the Arts and Crafts movement. Sunshine and fresh air were essential to the new emphasis here on health and hygiene in the home. The room’s increasing use for daily family recreation rather than special occasions is reflected by the increasing use of the terms ‘living room’ and ‘sitting room’. 1935: A living room from a Streatham flat – shorter on space, but incorporating the age’s latest conveniences. Architecturally, this would either be modernist or neo-Georgian. Interior detailing is minimal, with plain walls and ceilings, simple skirting and flush doors. Colourings were generally pale with little use of pattern, and painted walls preferred to wallpaper. 1965: A modernist townhouse living room from a small Highgate estate. 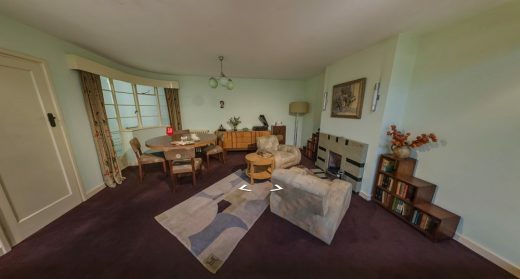 As you can see with space continuing to be at a premium, this room is designed open-plan with stairs rising in the corner and the hall dispensed with. This room was suited to the new informality in domestic and family life which marked a significant shift from practices at the beginning of the century. By this point, the television had replaced the fireplace in many homes as the focal point of the room where the furniture would be arranged around. 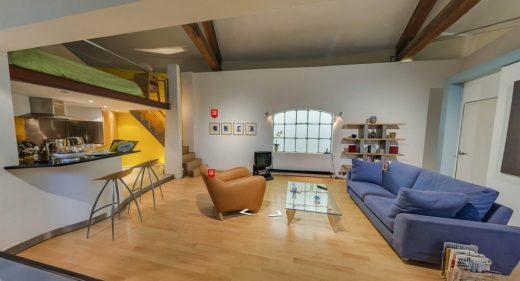 1998: A 90’s loft-style apartment. 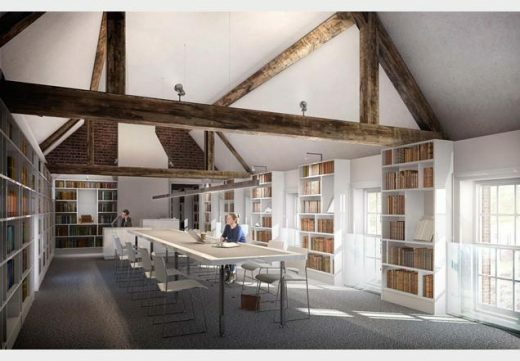 This room is created by architects who specialised in London’s booming riverside warehouse conversions during the 1990s that were needed to meet the expanding financial sector, typically housing the city’s yuppies and professional couples without children. Often, the defining feature of these apartments was ‘space’, and they consist of an industrial aesthetic which is far-removed from previous conventional domestic comforts. 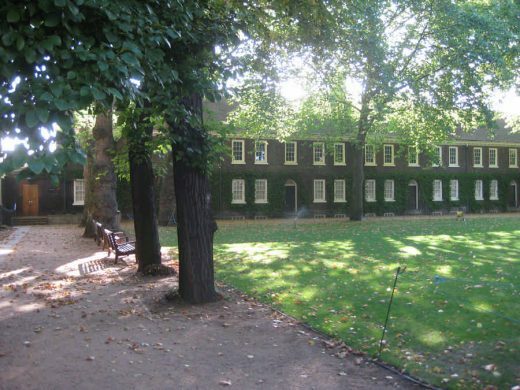 A £12.3million National Lottery grant has been awarded to The Geffrye Museum of the Home in East London for its ambitious expansion plans. 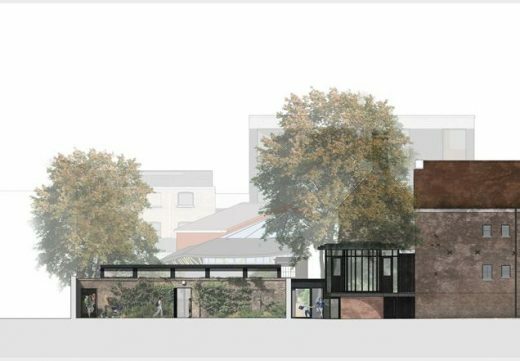 The Unlocking the Geffrye development will greatly improve access and enhance the experience of visitors to the museum’s Grade I listed buildings and gardens in Hoxton. Once the £18.1m redevelopment project is completed in 2019, 70% of the museum’s buildings will be open to the public, as opposed to the current 30%. New spaces within the existing museum buildings, including a gallery, library and central reception, plus built learning and event spaces, will enable the museum to welcome up to 50% more visitors each year. A wider range of existing collections will be brought out of storage giving the museum greater scope to explore the theme of ‘home’. 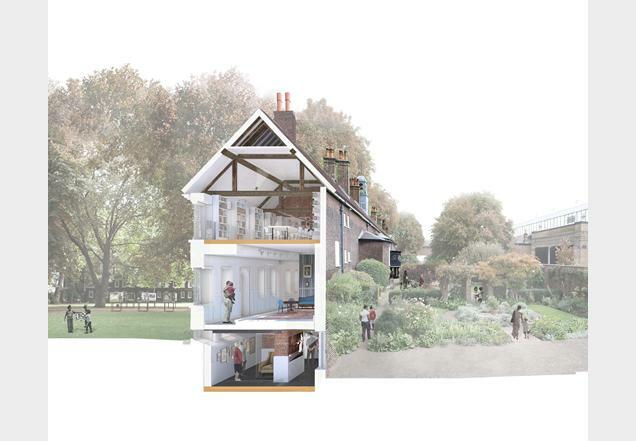 £15m proposals by Wright & Wright Architects to develop the Geffrye Museum have been approved by Hackney Council. Founded in 1914, this is a museum specialising in the history of the English domestic interior. 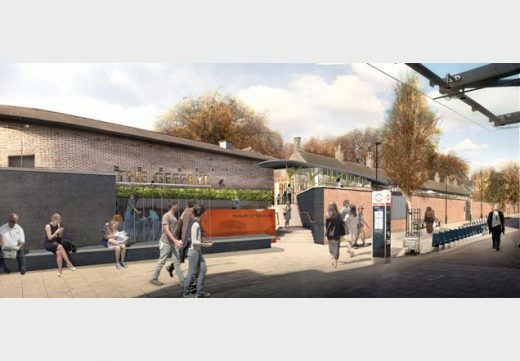 Named after Sir Robert Geffrye, a former Lord Mayor of London and Master of the Ironmongers’ Company, it is located on Kingsland Road in Shoreditch, London. 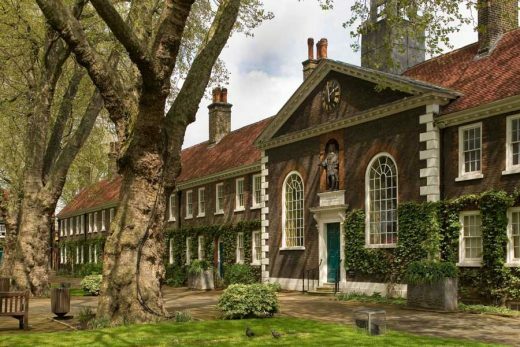 The main body of the museum is housed in the Grade I-listed almshouses of the Ironmongers’ Company, built in 1714 thanks to a bequest by Geffrye. The museum was extended in 1998 with an innovative yet architecturally sympathetic new wing designed by Branson Coates Architects. “Wright & Wright Architects are an excellent choice for the museum; they have a strong record of award-winning work with heritage buildings, sensitive sites and complex problems. They are listeners and have the interests of visitors, users and the general public at heart. We are looking forward to working in partnership with our local and wider communities”. The architects were appointed in 2014. 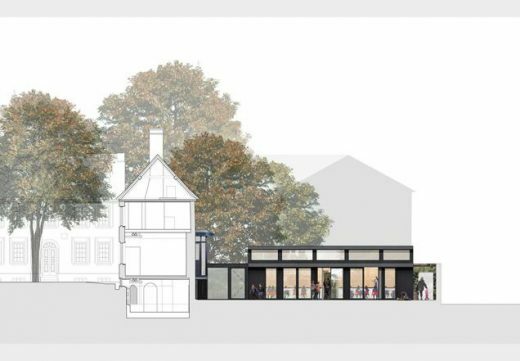 Campaigners opposed the plans by David Chipperfield Architects because of a plan to demolish a derelict Victorian pub at the corner of the site. The plans seek to solve the access and circulation problems at the museum building.